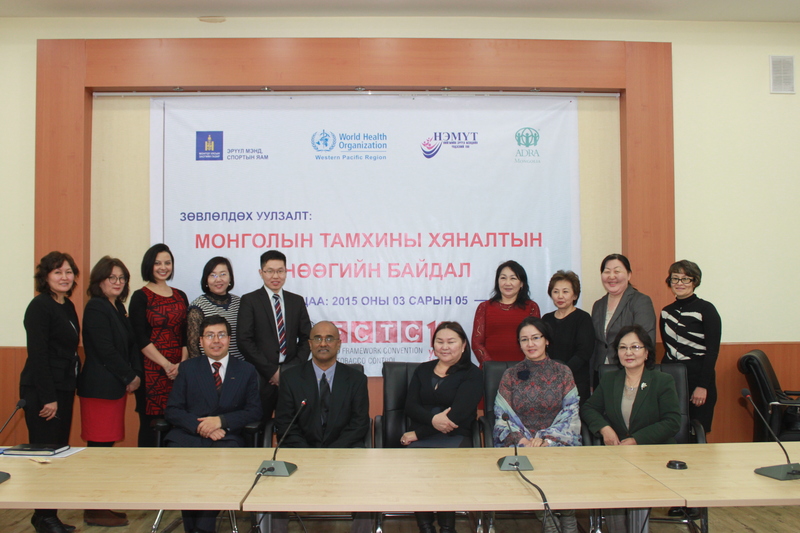 *Pictured above - Dr. Pramil Singh (seated second from left) meets with the World Health Organization (WHO) in Mongolia. Loma Linda University School of Public Health (LLUSPH) has been awarded a Global Research Award for Nicotine Dependence (GRAND). GRAND is an independently-reviewed competitive grants program supported by Pfizer to fund research into the treatment of tobacco and nicotine dependence. The LLUH award will fund a landmark intervention study of over 700 smokers in Mongolia entitled “Comparative Effectiveness of Cytisine versus Nicotine Replacement Therapy in the National Smoking Cessation Program of Mongolia: A Pragmatic Non-Inferiority Trial”. “Almost 80% of the world’s 1 billion smokers live in low and middle-income countries, and have no affordable pharmacotherapy products for smoking cessation,” said Dr. Pramil Singh, DrPH, principal investigator for the study. “Our trial in Mongolia tests a treatment with Cytisine that costs less than 30 USD for the entire course of medication and can provide affordable pharmacotherapy to help them achieve freedom from smoking”. Cytisine is a naturally occurring alkaloid found in plants, specifically in members of the Leguminosae family. Cytisine provides a low-cost pharmacotherapy treatment for smoking cessation. The treatment will be tested in addiction clinics of the national health care system of Mongolia that target low to middle income adults. Dr. Singh is the Director of the Center for Health Research at LLUSPH. For the past 15 years, Dr. Singh has been working on tobacco-related research and capacity building projects in the US and Asia withfunding from the NIH, WHO, Gates Foundation, and ASPPH. Jayakaran S. Job, MD, DrPH, a medical epidemiologist and Professor of Global Health, Epidemiology, and Preventive Medicine from the Center for Nutrition, Healthy Lifestyles and Disease Prevention at LLUSPH. Witold Zatonski, MD, PhD, President of the Health Promotion Foundation of Poland, and a cancer epidemiologist who has implemented numerous smoking cessation initiatives with Cytisine in Poland and other areas of Eastern Europe. Taznaa Enkhzaya, MD, MHA, Director of the National Tobacco Control Program of the Ministry of Health in Mongolia. Bayarmaa Vanchindorj, MD, Deputy Director of the National Center for Mental Health in Mongolia. Chimedsuren Ochir, PhD, MPH, Dean of the School of Public Health of the Mongolian National University of Medical Sciences. The two-year trial will begin to enroll subjects in the Fall of 2017.